When we commit to learning from other people’s experiences alongside ours, it prepares us ahead for life. It opens our eyes, widens and increases the depth of our imagination and vision. Potential mistakes are revealed and many times we even get to obtain the solutions or corrections to those mistakes ahead of time in case we repeat them ourselves. It’s like a student who combines the use of past questions for studying alongside whatever he has been taught in class. The past questions give him an insight into the likely structure and form in which the examination would occur, taking him several steps ahead of the ordinary or average student. However, not all past questions come with answers. Some experiences just show you the mistakes, it is up to you to figure out the lessons, the possible corrections or solutions and in the process of thinking, searching and observing for answers, your own divine wisdom is born. A person who tells you or shows you his mistakes and lessons is like the man who hands you a lamp in a darkened path, lighting up your vision thus, enabling you to see the ditches and thorns on that path, thereby, saving you from a great fall or a few scratches from the thorns sometimes even helping you to spot a wild animal from afar so you can hide or run for your dear life. 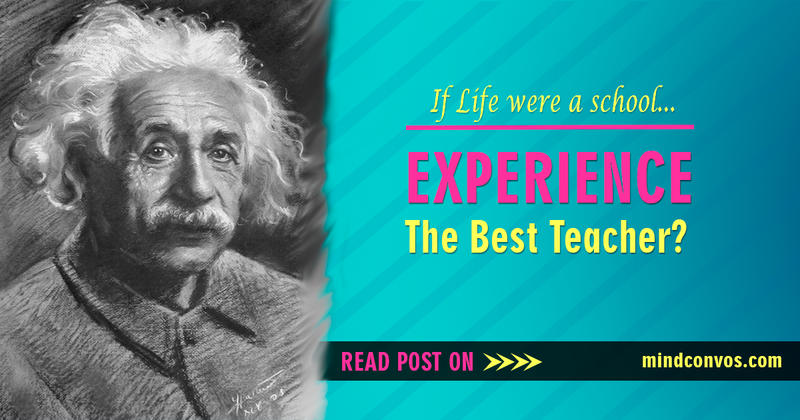 If life were a school (imagine life being a very big school), then from the wealth of experiences from the abundance of humans present in the world, we all can agree that it would be a school packed with lots of teachers; great teachers and not-so-great teachers, even bad teachers. It is up to you to choose your collection of teachers and keep expanding upon the number (new experiences are born every second). Remember that it is not just having the best teachers that makes a great or high flying student but also being able to commit to learning as much as possible and putting that knowledge to great use, thus enabling a better and improved quality of living for you and the society at large.